My Nexus 4 finally got delivered to Singapore from USA Google Play Store. Here’s a quick sharing on how the whole thing went down from purchase till final delivery. It was shipped out on Sat morning, and reached ComGateway on Monday. It was originally scheduled for Wed (Tue was not a business working day), but reached early. Typically, you are looking at a fixed 2 day business day delivery. Count in another 1 business day (Google asks for 2) for them to prepare to ship out. But as you know by now, the Nexus 4 launch was screwed up, and I can’t comment on how long before Google ships it out. It takes time for ComGateway to reflect that they have receive your packages. In my case, it was processed by 7pm (Portland time). A total of 8 hours was taken. ComGateway will open up your package, scan a copy of the invoice, measure the shipping weight/dimensions. With all this information, you will know how much it costs to ship the item back to Singapore. If the cost of the item is not reflected on the invoice, you will have to declare it. If the total cost of the item ( and shipping) exceeds 400 SGD, you will be charged GST accordingly. All amazon invoices come with the exact cost of the item, which ComGateway will input for you. (no cheating of the system). But in the case of the Google Play Store, you’ll have to enter in the cost of the item yourself. If you so decided to input a lower cost, to go below the GST ceiling, do note that it would affect the insurance of the item as well. Should your package go missing, you’ll only be paid whatever cost you declared. It cost $14.51 exclusive of GST charges to ship a nexus 4 back to Singapore. Total Chargeable weight was 0.5 kg. I paid up at noon Tuesday (Singapore time) (non working day), it was subsequently picked up by DHL from ComGateway at Thursday 10.20 am (Portland time). So we’re probably looking at 1 business day for CGW to pick it up, and pick up by DHL the next day. This means we’re looking at 6 working days for delivery after payment (after accounting for time differences) CGW provides an estimate of 6-8 working days. I’ve googled around, and the timeline for delivery to Singapore from ComGateway is pretty standard. Unfortunately, my delivery had a screw up. I called on Sunday arranging for a delivery on Mon evening. Some how DHL failed to process that. At least their customer service had records of all my calls, and was pretty courteous. I called up 3 times. I finally received my phone on Tuesday. But otherwise, the 4 day delivery is pretty fixed. If you go to the DHL website, their estimate of delivery and tracking service is pretty good. DHL does deliver on Sunday. but you need to make a prior arrangements (call in). If your package arrives on Sat, you can call and ask for delivery on Sunday. 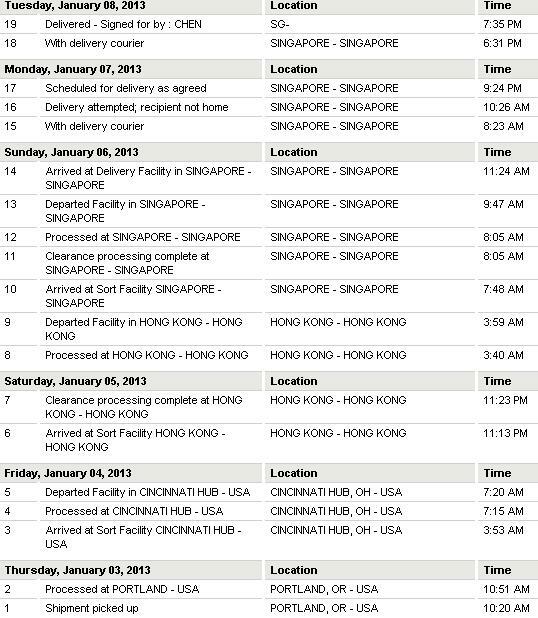 If it arrives in Singapore on Sunday, the earliest you can receive it is Monday. For items shipped out on Friday, you will receive it on Tuesday. It will arrive in Singapore on Tuesday morning, and be passed on to the delivery courier immediately. My phone arrived pretty safe and sound. First impressions are it’s fast and smooth. Very fast and smooth. It heats up easily too. Not unbearable. But it’s there, and feels hotter than my Samsung Galaxy S2. Thanks :) Too bad your personalised concierge shipping service from USA couldn’t coincide with the Nexus 4 shipping. We can try it again later this year! Hi Can you please let me know exact cost of NEXUS 4 including Shiiping, taxes and GST. Also let me know that you got 8GB or 16GB? Nexus 4 costs 349 usd for the 16gb. Assuming you paid GST, you’re looking at about $490 sgd. Can you share which US site you bought the N4 from? Was it amazon or the Google Play store? If it was from Google directly, how did you get around the non-US IP address issue, as they block purchases from sites outside of the US. Thanks! Hi, it was directly through the Play Store. You could use a VPN (configure it for Windows) – such as the one highlighted here (still working). with GST and Shipping – approximately $490 sgd after conversion. does this amount include the concierge service by CGW? Thank for this useful post! My Nexus 4 16gb with bumper is on the way to my CGW address now. Hopefully I will get it next week! Great to hear :) you bought yourself a good phone. let us know how it goes.